Once a century, one person is chosen for greatness. Elisa is the chosen one. Elisa could be everything to those who need her most. If the prophecy is fulfilled. If she finds the power deep within herself. If she doesn’t die young.Most of the chosen do. This was awesome! I loved the super-uber girl power! Starting off, it was slow, but nonetheless intriguing. Princess Elisa was so helpless and self-loathing and I found her hard to connect with, but boy did that change quick. Elisa went from lonely, fat, and no self-confidence to strong, fit, independent and a highly intelligent leader with an endless supply of people who loved her. How’s that for a 180? Elisa wasn’t the only character to love in this story. I enjoyed the many-layered characters throughout the story. I was constantly surprised by all who surrounded Elisa. No one was what they appeared at first, or even second glance. The relationships grew gradually and realistically, and I felt equally as hurt and/or betrayed as Elisa when something went wrong. And so, so many things went wrong for poor Elisa. 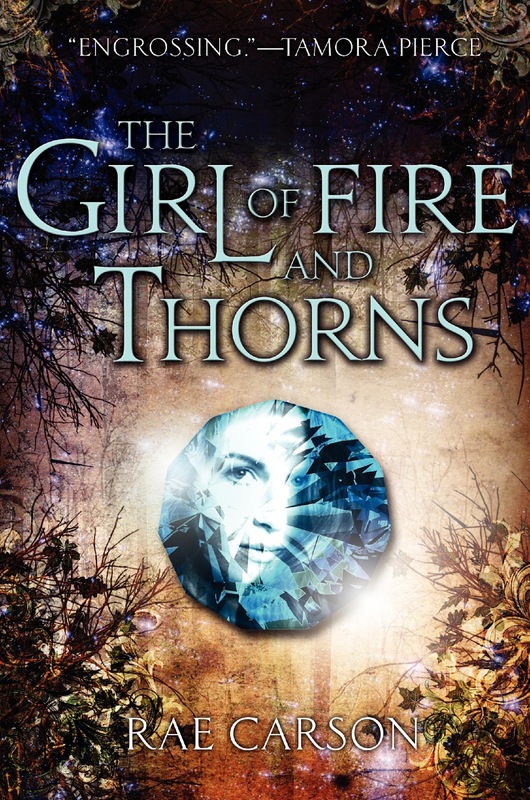 The romance in Girl of Fire and Thorns was secondary, really thirdary. Is that even a word? Well, it is now. Sometimes I wanted more, but it worked well because this was more a story of Elisa’s self discovery than falling for a guy. That said, I’m all about Humberto, he has my heart! There is a religious aspect to the story, the Godstone in Elisa is supposed to give her a direct connection to God. I was surprised that it was never an issue for me. It wasn’t preachy in the slightest and actually added depth to the story and Elisa’s character. This worthy adventure delivers great twists and turns, lots of intrigue, exciting action and excellent character development. Straight up fantasy is usually hard for me to get into, but I had no problems. I would label this baby as a must read. And I cannot, I repeat, cannot wait to get my hands on the sequel! Argh - the waiting! This sounds great! 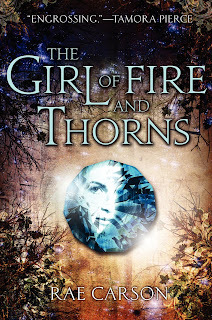 I like a little romance in the books I read, but I prefer the story to be based on some other aspect, like self-discovery or adventure, and it appears that The Girl of Fire and Thorns has both. Never heard of this book before now, and it definitely sounds interesting. I am a fan of fantasy, so I shouldn't have a problem getting into it. Great review! Great review! I loved that Eliza changed so much but also sad about what happened to Humberto because I totally wasn't expecting it. I read so many mixed reviews about this one because it seemed that the main character was worthless while she was fat and then when she lost weight became worthy of love and respect. Some reviewers were better explaining that than others but still it left me questioning whether I wanted to read it when so many readers didn't get the real point. What do you think? I too have read many mixed reviews on this book. But I'm a sucker for a main character that exhibits serious growth through the book. I'm going to have to check this one out. This definitely has both. I was expecting a huge romance angle, but not disappointed in the slightest when it was so minimal. Elisa turned out to be so awesome! The Godstone bit gave me pause too. And I'll admit, it weirded me out when she talked about it sometimes - not because of the religious part but because its a stone lodged in the skin of her belly. Am I just supposed to liken that to a belly ring or something? Anyhoo, not a major hiccup, just something that made my brow wrinkle once or twice. Can't wait to hear what you think when you get to it! If your into fantasy you should definitely give this a try! Hope you check it out! It wasn't sudden. As her life and dangers around her changed she gradually adapted into the person she needed to be to survive it all. And if she hadn't changed, I probably would've chucked the book at the wall half way through. I know me either! I was so devastated! He's just so awesome!! I wouldn't say she became worthy of love and respect because she lost the weight. She ends up kidnapped and the kidnappers don't have a lot of food plus she has to walk a lot and, tada, she starts loosing weight. And its during this time that she begins to realize that because she's survived thus far that she's not as weak as she thought she was. So as she's kind of forced by external circumstances to get in shape she also starts respecting herself and learning about who she really is without her sister or others around her pushing their own agenda on her. And as a result others start respecting and loving her just as much as she respects and loves herself. And as for her weight, I never got the sense that she became skinny, just fit and capable of walking across the palace without suffering a heart attack. Also, her new husband suddenly starts liking her after she's lost the weight and escaped back to the kingdom. She doesn't return his feelings because she knows that his new appreciation is based on her new physical appearance. Whereas before the kidnapping, she would've accepted the attention, now she wants him to love her for what she is on the inside. I'll stop now, but I hope that answers your question. Yes! Can't wait to hear what you think! Thirdary? Love the creation of new words! I agree this one definitely started a bit slow, but I adored Parts 2 and 3 and now can't wait to see what happens in the next book:) I was loving the growth Elisa showed in the second two parts of the book, I'm looking forward to seeing how much more she grows as the story continues.